Here's something you probably haven't even heard of yet. It's a little something that Google engineers have been working on for over two years, which will change the very way your Android smartphone runs apps. ART, which is short for Android Runtime, aims to replace Dalvik and change the way your Android-powered smartphone runs. 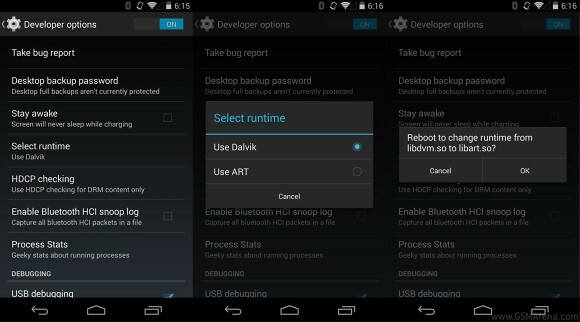 Dalvik is the one responsible for running apps on Android. Its runtime uses the JIT complier (Just-In-Time) to interpret bycode, which is a partial version of the original application code. ART uses the AOT process (Ahead-Of-Time) and basically pre-compiling the bycode into machine language the moment an app is installed, making them in essence native apps. This will eliminate the need for a virtual machine or interpreting code, which will cut startup times greatly. Currently ART is in experimental stages but you can still enable it on your KitKat Nexus device by going to Settings > Developer options > Select runtime. Keep in mind that this will require a reboot and will take about 10 minutes to boot all apps up again. Also don't try this on other AOSP builds right now as it makes the OS crash and become unusable. Initial observations show that execution time on most apps has been cut in half. And once Google gets around to making ART official, the runtime process would be market ready and much faster. The compromises with this method of running apps is that each app would take a longer time to install, which isn't ideal if you're coming from a backup and are waiting for loads of apps to install. Also the app would consume more storage because the bycode is being fully compiled - around 10% to 20% more. Still if ART proves ready for prime time it would promise better app loading times, increased battery life and superior multitasking. For a more detailed explanation visit the source link. me too, I guess, but not sure, they have not enabled it yet for tablets.